The film versions of Richard Price’s first two novels, The Wanderers and Bloodbrothers, are like a case study in what makes an adaptation succeed or fail. The Bloodbrothers movie, which Price disparagingly said reminded him of a spaghetti commercial, actually stayed pretty close to the plot of the original book (apart from the ending), but changed countless details throughout in order to soften the harsh story for the screen. 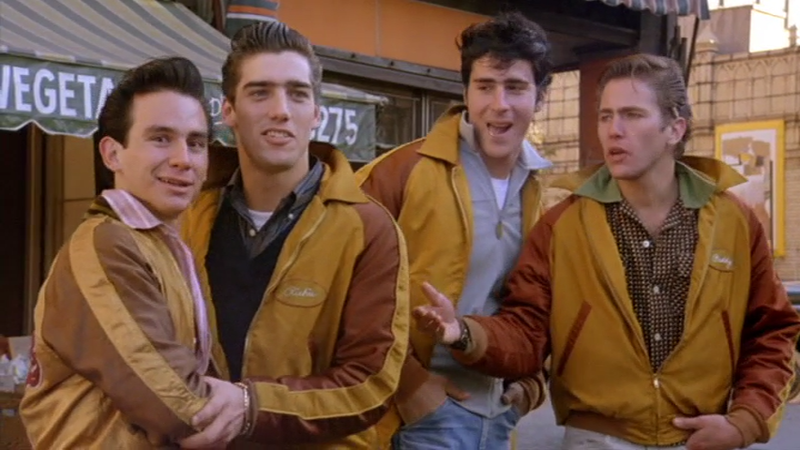 In contrast, while almost every individual scene in the silver screen staging of The Wanderers, Price’s darkly comedic debut novel about teenage gang members in the early ’60s, is taken from the book, those component parts are all re-ordered and rearranged in terms of how they relate to each other. We still see a hapless teacher trying to instill some tolerance in a class divided between Italians and blacks, but that moment is now used as the instigation for the two sides’ ill-fated football game, which is now a gambling opportunity for the gangsters from the bowling alley, one of whom is now the father of Richie’s girlfriend, who now gets pregnant like Buddy’s girlfriend did in the book, etc., etc. It’s like husband-and-wife screenwriting team Rose and Philip Kaufman grabbed a loose thread hanging off the novel and pulled until all the chapters were scrunched up real snug against each other. That rightness is partly due to the fact that while the characters and their storylines are altered in countless ways, they aren’t cleaned up like the ones in the Bloodbrothers film, which consistently made Stony de Coco and his family seem like saints relative to their textual counterparts. 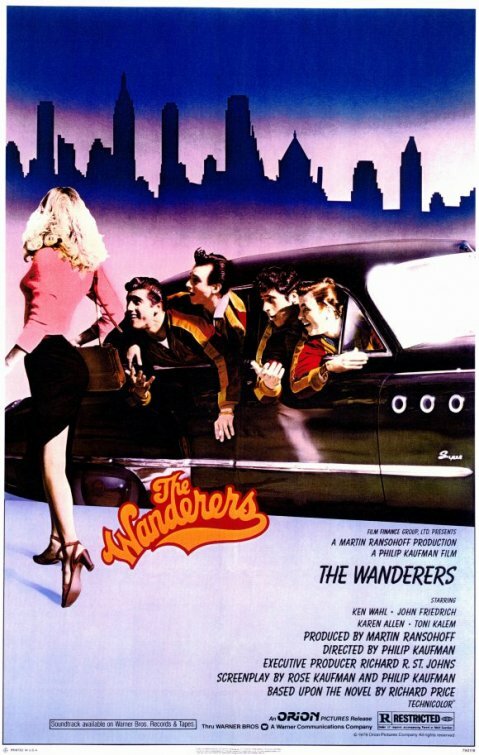 The Wanderers, on the other hand, survived the transition from page to screen with their dimwittedness, brutality, casual racism, vulgarity and constant horniness intact. They’re still ultimately sympathetic, though, thanks to the capable efforts of the film’s cast. The young actors’ likable performances are even more impressive when you consider that they were mostly unknowns when they were cast and have mostly remained so since; of the four Wanderers featured on the poster, not one has a screen credit past 1995. John Friedrich, great as Joey, apparently retired from acting in 1984 at the age of 26. The most recognizable face in the cast is probably that of Raiders of the Lost Ark‘s Karen Allen, who shows up as “Nina,” a character named after Eugene Caputo’s girlfriend from the book but who actually partially fulfills the role of the book’s “Despie,” with film-Richie’s girlfriend (who is named Despie) assuming the rest of book-Despie’s storylines but also kind of standing in for book-Richie’s girlfriend “C.” Man, this script must have gone through a lot of drafts. My praise here shouldn’t be taken to mean that the movie perfectly reproduces the book’s spirit (not that it’s obligated to). The novel took the Bronx street stories of Price’s youth and exaggerated them into tall tales, but there was still a sense of genuinely gritty realism to its execution. The film, on the other hand, amplifies the unreality even further, taking it from campfire story to comic book. The imagery is cartoonishly colorful, the dialogue more straightforward and expository. There are a few moments that drop any pretense to realism for the sake of a sight gag, as when a potential “elbow titting” victim seems to have a four-foot growth spurt as she approaches the boys, or when an intimidated Joey looks up at a group of black football players during a scrimmage and sees them hulking over him like behemoths, literally larger than life. So the Bloodbrothers and Wanderers adaptations both feel less “real” than their source novels; the difference is that while Bloodbrothers felt stuffy, this movie feels vibrant. The film also shifts the story from 1962 to 1963, apparently so that it can borrow some emotional resonance from watershed moments like the JFK assassination and the emergence of Bob Dylan. Those references come off as ham-fisted, but, on the other hand, their very gratuitousness is kind of in keeping with the movie’s over-the-top, almost campy tone. 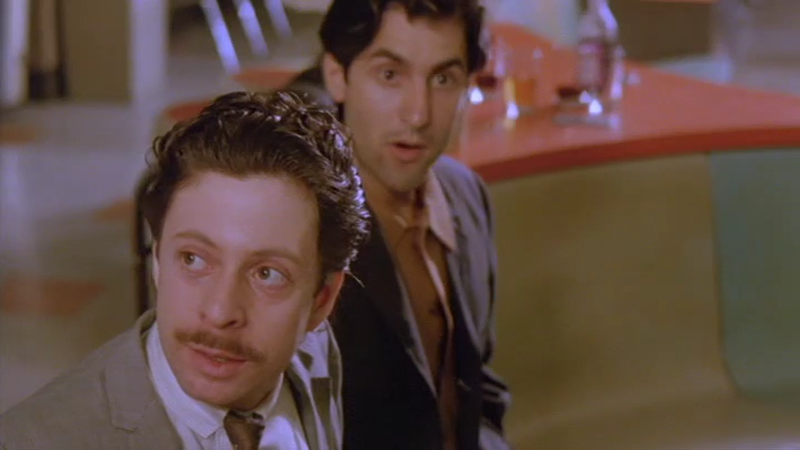 And speaking of watershed moments, Richard Price himself shows up onscreen here as a bankroller of some bowling hustlers, marking the first instance of the Obligatory Richard Price Cameo. This is a phenomenon which we’re going to come across pretty often and which never fails to impress me. When I think of a writer’s role during the filming of their work, the first image that comes to mind is Charlie Kaufman getting shooed off of the Being John Malkovich set at the beginning of Adaptation. But Price frequently manages not only to get in front of the camera but also (as is the case here) to get some actual lines! He must put it in his contract or something. That’s one flaw in a mostly effective film, one which of course isn’t as good as the book it’s based on but might still rank as the best screen adaptation of a Richard Price novel yet (although I’ll have to re-watch Spike Lee’s Clockers and get back to you on that). [UPDATE: Nope, still don’t like Spike Lee’s Clockers.] Nevertheless, The Wanderers, despite its effectiveness, didn’t make much of an initial impact, getting only a small limited release. It’s developed something of a cult following since then, but it’s still overshadowed in our cultural memory by The Warriors, which was also released in 1979 and used similarly exaggerated New York gang subject matter as grist for a Homeric hero’s journey rather than a raunchy ensemble comedy. But it was a creative success if not a commercial one, and that fact, combined with Price’s involvement in the production–limited though that involvement was–may have taught Price that the best way to protect his work was to stay as close to it as possible: Both of the subsequent adaptations of his books, Clockers (1995) and Freedomland (2006), would have the man himself on screenwriting duty. • The “Pharaohs,” an Italian gang in the book, are described as a Jewish gang here. Nice touch. • Chubby Galasso’s reference to The Hustler during the bowling alley scene is particularly funny given that Price would later write the screenplay for the Hustler sequel The Color of Money. • Philip Kaufman would later cast Tony Ganios as another character named Perry in the 1993 Michael Crichton adaptation Rising Sun. Next week: Richard Price dives into a post-college identity crisis with his 1983 novel The Breaks. This entry was posted in Films and tagged film, movies, richard price, the wanderers. Bookmark the permalink.